SQL Server Partitioning 101 - bzzzt! This is going to be demo heavy, and will discuss what is happening along with the demos. I’ve provided links at the bottom to other sources that may speak moretheory and less practical should you wish to read more on the subject. First let’s create the database. Nothing much to see here other than creating a common database with one file, the default primary filegroup and a log file. Then let’s create a new filegroup which the partition schema will be stored on. When creating a partition schema, you can use the primary filegroup. There is nothing preventing us from using the primary filegroup, or specifying any number of filegroups to hold the partition ranges specified (if this isn’t totally clear read on and I will explain further down.) Really how you define where the data is going to be stored depends on the design of your database. Now we have the filegroup let’s create some files for it so that we can store data on the filegroup. Ok, let’s create the partition function and partition schema. 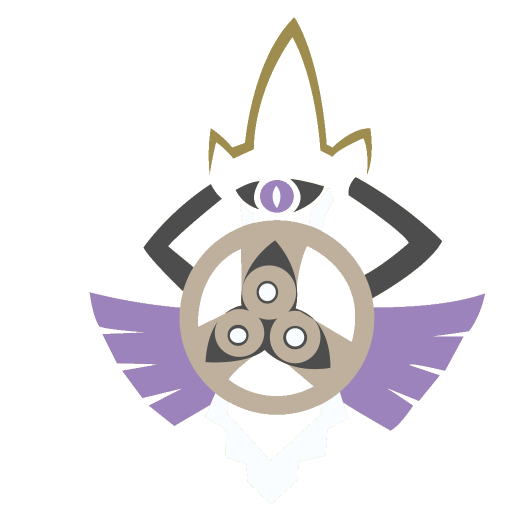 The second command is creating the partition schema. This maps the partitions of a partitioned table to filegroups for storage. In this example I am storing them ALL to the filegroup we created earlier, FGDexId. If you include the ALL, only one filegroup can be specified. So naturally this means we can store partitions across filegroups. So if you wanted to you can create more filegroups and include them in the TO statement. Partitions are assigned to the filegroups in the order which they are specified. You can specify a filegroup more than once, however if there is not enough filegroups to partitions specified the create schema statement will fail with an error. 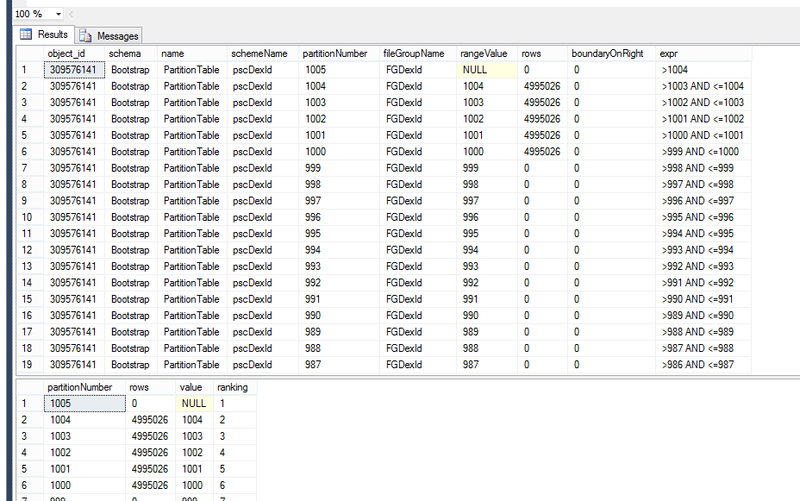 In SQL Server 2012, the maximum number of partitions is 15,000. This was increased significantly from SQL Server 2008 where the maximum number was 1,000 partitions. I don’t want to create all 15,000 partitions now, but I want to create some more wityh little effort. To create more partitions, you have to split a range, that is creating a new boundary. As long as partitions are empty, this is a near instantaneous process (and it’s a head achingly long time if there is significant data to split… more on this later.) The SQL below wlll script out the SQL needed. So I’ve covered the split, but what is this NEXT USED? As stated earlier, for every partition created you define a filegroup to store the data on. Splitting is the same as creating a new partition as you define a new boundary, so you need to define which filegroup the NEXT partition created will be stored on, which is why you run the NEXT USED and then create/split the partition. So now we’ve got our partitions created and stored on a filegroup, and we know how it is created, but how can we monitor the partitions? BOL shows that there are some object catalogs that we can use such as sys.partitions, sys.partition_scheme and sys.partition_function, but there’s nothing out of the box we can use. Here’s two stored procs that can be used for this example, and they can most likely be tweaked to work with most partitioned tables. There are two stored procs because the second stored proc is very informative but can take a very long time to run if you have many partitioned tables across many partitions functions and schemas. The first stored proc runs very quick and will be suitable for most enquiries. Here’s the first, fast sproc. It only requires that you pass in one variable, the name of the partition. In the case of our example it is “DexId” and it uses the name of a table that is partitioned (we’ve not that far to creating a table yet). It also only returns the top 100 partitions, so you may want to alter this. this is because this is correct. There are no partitioned objects stored on the partitions. Let’s start creating some objects and populating the database with data. This table is stored on the primary filegroup, so we will expect to see the file fill up a little bit after adding the 1,000 rows. Now let’s create a table on the partitions. I created a clustered index as standard, and created a constraint. A constraint will have no impact on partitioning, but the same cannot be said for non clustered indexes, or even clustered indexes/non clustered indexes on views that reference the partitioned column. This topic, called partition alignment, is a topic for another post. If you’re the impatient type and want to know more now I recommend this post on SQLFool. 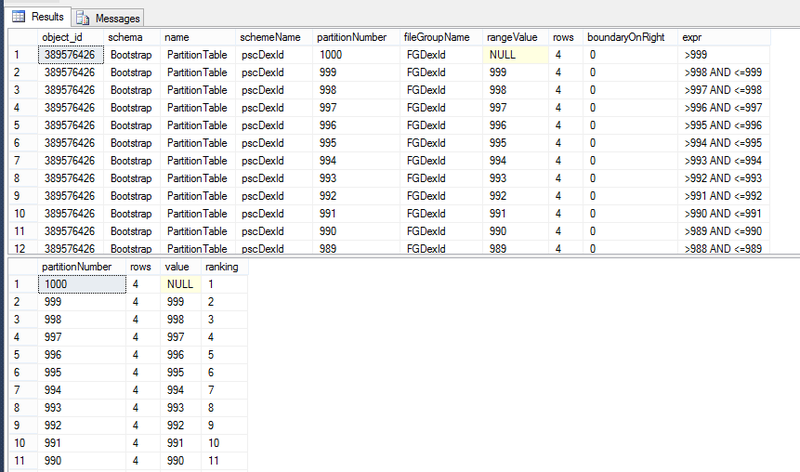 However for this post I wanted to demonstrate that foreign key constraints will not impact partitioning tables. 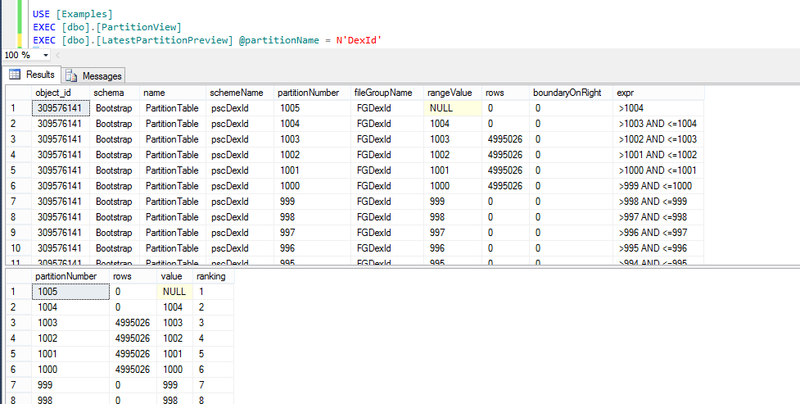 Unlike in the previous example, where we stored the table on the primary filegroup, we are storing this table on the partition schema “PscDexId” and we are determining which column to partition by as “(DexId)”. So without even adding any data, if we run the two sprocs we will see the table partitioned. The top sproc gives us all the info we’d need to know on a partition schema; the name of the table, the partition scheme name, the number of the partition, which filegroup the partition is stored on (particularly useful if you are using more than one filegroup) it’s range value and also the expression that defines which partition the data will be stored in. This is important to appreciate; you define the boundaries, not the db engine, and you need to manage them, not the db engine. If you are not careful with your boundaries, you will store more data in a partition than you intend to, and other than your own checks there is nothing to prevent a switch from dropping more data than you intend to. Keep this in mind as we go on. The bottom sproc is an abridged version, however you can infer the boundaries by the value from the previous partition. Running the stored procs show us that the data has been split into it’s relative partitions: the data was split by the DexId into the relative partitions. this is all fairly straightforward; we defined the boundaries when we created the partition schema, we defined which column to partition by when we created the table, and with 1000 partitions and the maximum number being 1,000 this all fits into the concept of partitioning very nicely. Truncate the table for the next example. Oh dear. The top partition now has 5 rows worth whereas all the other partitions have the correct number of rows (1). Because we did not have partitions created for the DexId boundary, our expression shows us that anything with a value of greater than 999 will go into that top partition. When this occurs we can either leave it (bad), delete it (not great) or split. You can split the top partition on boundary values even if the values with in the top partition will exceed the new boundary. The db engine will shift the data around. in our example this will take no time at all. But in the real world, where partitioning is used in data warehouses and may well have millions, or even billions of rows per partition, this will be a very time consuming task, with much locking taking place. This is why it’s really important to make sure that partitions are created before entering the data. If you do find yourself in a situation where you have many runs within one partition and you want to split it out, you need to consider which direction you split from depending on whether you store the data to the left or the right. This might sound confusing, but logically it works like this; if you store the values to the left of the boundary, then when you split you want to split from the bottom range upwards. That way it will only move that one range out of the current partition into the new partition. And the opposite applies when you are storing the data to the right: splitting from the top to the bottom means that you are moving only the top range out of the current partition. And if each run is roughly the same size, then the time taken to split the range will be roughly the same. Let’s take a little digression here to illustrate this point. (Run this example if you want to, but inserting this many rows like this can cause a few issues). I inserted 25,000,000 into the top partition with ranges that, to retain the integrity of our partitions, have to be split out. I ran the stored proc midway through the inserting of data to verify show that all the data was being stored in the top partition. I then ran the split from the top to bottom. If you are following at home, run one at a time. This will take minutes to run for each partition split, so do not be alarmed if it takes a while. All the splits took the exact same amount of splits because we were only moving the partition out. Not only that, but the logical read was twice as fast as the fastest split from top to bottom. This means you really need to know which way you split partitions if they are mistakenly merged. So now, if you run the file size query and the stored procs, the files that the partitioned table is stored on has grown and that our partitions are separated out as designed. One of the big advantages of partitioning a table is that you can switch partitions in and out of a table instantly. So you can delete data out of a table by switching the partition out to a temporary table and dropping the table. First create an empty resultset that is a direct copy of the table we want to switch out of. However, this empty table is on the primary filegroup, plus we need to rebuild the table with page compression and have the exact same clustered index to accept the switch. If the table is not on the same filegroup or matching compression then the switch will fail. As the resultset only creates the columns and not the index, we can add the clustered index and target the filegroup that the partitioned table is stored on. Note, this is not a partitioned table, nor does it need to be on the partition schema, it just needs to be on the same filegroup. Now the table is ready to switch into. Now that temporary table has the entire partition switched into it. And if you check the partitions using the sprocs you’ll see that the partition is now empty. You’ll also see that the filegroup has not yet regained any space yet, but once you drop the temporary table we will reclaim the space in the files. Switching and deleting the table does not get rid of the partition, the partition continues to stay in the ranges available. If we want to remove the partition from the ranges we have to merge. Like splitting, it’s important to merge correctly to prevent data moving around. 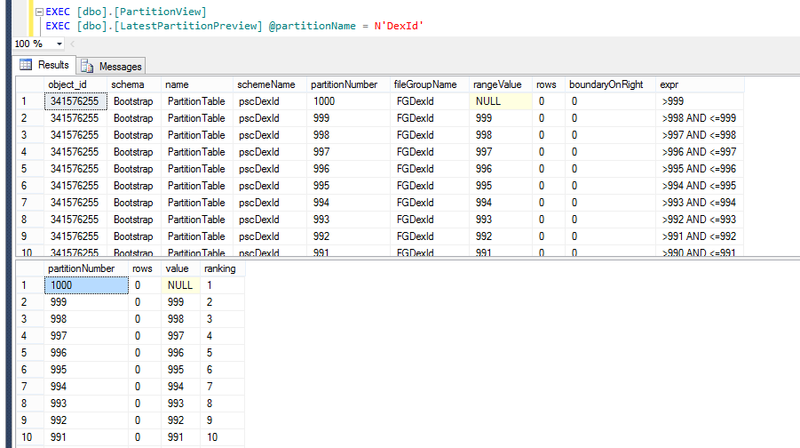 Run the script below to truncate the two tables and insert data back into the tables. The script above will enter data into partitions whose number leaves a remainder if divided by 2 and 3. With regards to merging, if we merge the empty partitions into the partitions with data we will have to move data. If we merge partitions with data into partitions that are empty we will have to move data. 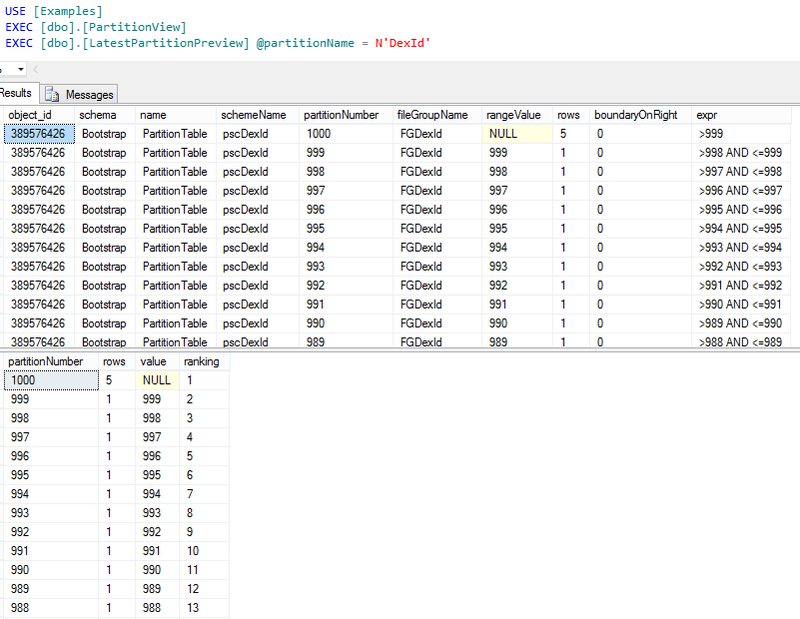 This is because sql drops the partition and merges the range values into the partition above. To ensure that no data movement occurs, the safest thing to do is to merge only those empty partitions into other empty partitions. Some of the partitions have large amounts of data in them, try merging and splitting with this data to see the time it takes. I named this post “Partitioning 101”, however partitioning itself is quite an advanced topic, and requires some reading and re-reading and testing in a development environment to ensure that what you think you are doing is the actual outcome. It can be a costly mistake, in terms of data lost or time wasted incorrectly merging/splitting/switch and dropping partitions if you do it wrong. There’s quite a bit of resource on the Brent Ozar site for partitioning. I’ve not read all of it myself but if it;s anything like hte rest of hte content on that site it’ll be worth reading. Read MSDN for creating partitions schemas.